Looking to leverage “open in” from Drafts 5 to Scrivener. Seems like it should be possible, but I’m still struggling with how to create actions at all…much less how to open in Scrivener. “How to” would be much appreciated, as there are no current articles on this in the forum that I can find. Appreciate the pointer. 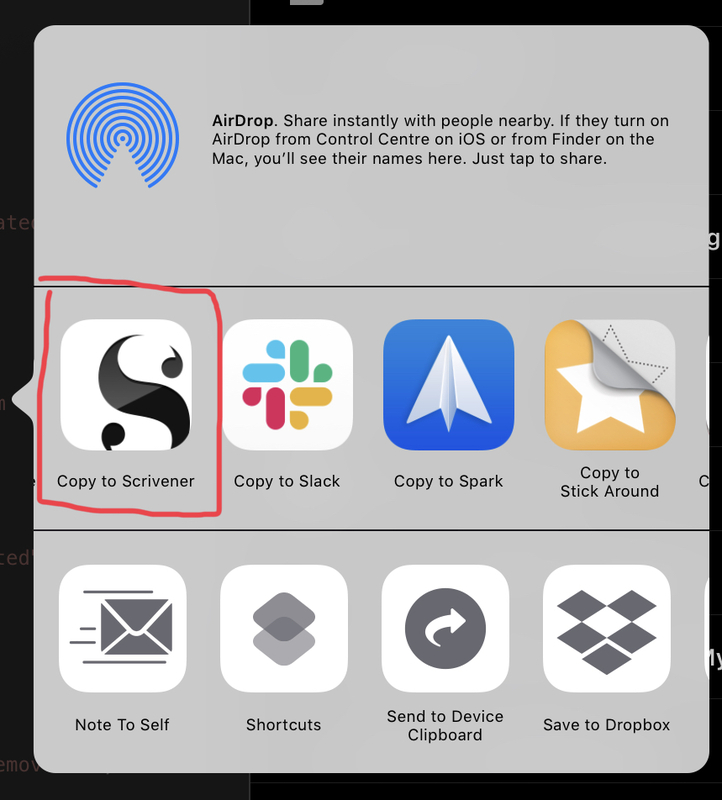 I’ve read that article again and again, and I’ve looked in “Open in” in Drafts 5…not sure what I’m missing but I don’t see anything that shows me how to get something exported to Scrivener. All it says is that it does…but I can’t figure out how. When you use an action utilising open in, you can select to pass the draft content ([[draft]] template tag). Then one of the options should be to copy that to Scrivener. Thanks @sylumer, this is what I was looking for. One last question: how did you get from the [Templates] to the [Copy to] step? I can find how to make that pop up. I looked through all the template options, and that didn’t seem to have the answer. Here’s a step by step that hopefully covers things enough for you. The two screen shots are from two separate processes. Editing an action and running an action. You must be a pro subscriber to edit actions. Swipe from right to left (from the right side of the screen) to display the actions list. Swipe right to left on an action to reveal options. Tap on the action to run it. As the action steps progress, the Open In step will be reached and will activate. Here’s a simple, one step action that carries out an Open In action. It’s just the default action settings and matches my earlier screen shot. 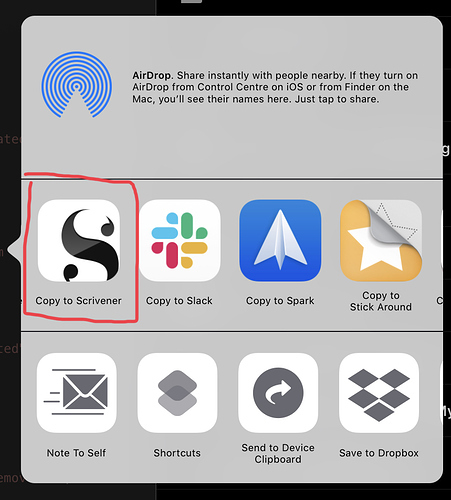 Now this action/approach does require you to manually specify Scrivener as the Copy To receiver each time. It is possible to utilise Apple’s Shortcuts app and a Drafts Action together, to in effect do the same without the manual step. Drafts Action: Open in Scrivener. Sends the Draft content to a shortcut in Shortcuts which it is instructed to run. Shares the content it receives directly to Scrivener, without needing to activate the sheet for manual selection. Note that you must have a Scrivener project open to receive the content from Drafts. Yup, that’s it! Thanks @sylumer…really appreciate your patience and help.